A ppreciation for your favorite Highland Brewing Company seasonal doesn’t have to stop at the bar. Now you can lace up your hiking boots and see firsthand the inspiration behind some of the brewery’s signature suds. “Highland names its seasonal beers after trails and mountains that the Southern Appalachian Highlands Conservancy protects,” notes Anna Zanetti, the organization’s AmeriCorps outreach associate. She helps lead beer-themed hikes, which arose from a partnership among the U.S. Fish & Wildlife Service, Highland, and SAHC. The initiative, dubbed For Love of Beer & Mountains, supports conservation efforts and increases awareness of the area’s unique natural treasures. Five hikes are slated for 2014, with the next two happening in May and August. “It’s especially exciting now, since 2014 marks Highland’s 20th anniversary and the 40th anniversary of the SAHC,” says Zanetti. All the more reason to raise a pint. May 15—SAHC celebrates its 40th anniversary at Highland Brewing Company in Asheville, where brewery founder Oscar Wong and his crew are creating a limited edition Elevation Ale to mark the occasion. Find details for this and other events at appalachian.org. 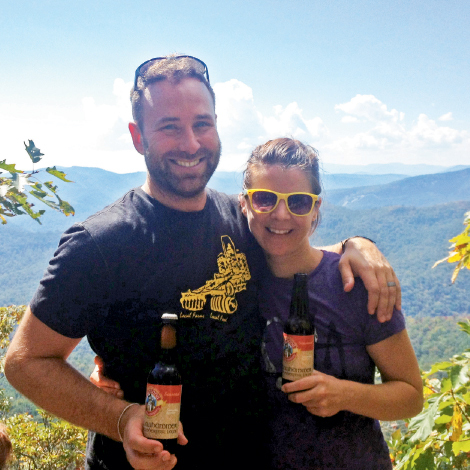 May 17—Toast to Highland’s Little Hump Spring Ale following a hike to Little Hump Mountain. This trek, designed for well-conditioned hikers, will be strenuous. The beer is an American pale ale crafted with three grains. August 1—This hike takes participants to a private tract of land that straddles Buncombe, Yancey, and Madison counties to glimpse Razor Wit Mountain, for which Highland’s Razor Wit seasonal, a white ale, is named. To sign up for a hike, contact Anna Zanetti at anna@appalachian.org.